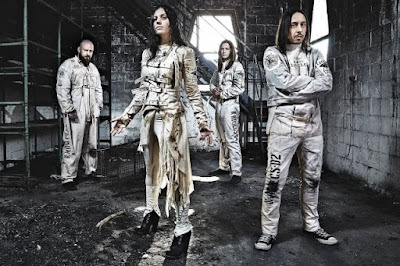 MetalRockNews: Lacuna Coil's Andrea Ferro: "The new album 'Delirium' was inspired by how crazy normal life is today"
Lacuna Coil's Andrea Ferro: "The new album 'Delirium' was inspired by how crazy normal life is today"
Lacuna Coil singer Andrea Ferro was recenty interviewed by The Age Of Metal, you can read some excerpts below. About if Lacuna Coil's visit to an abandoned real-life sanatorium in Italy several years ago inspired the concept of the band's new album, "Delirium", Ferro said: "Well, basically, everything started when we found the word 'delirium.' And when we were working on the song 'Delirium', we needed one word for the chorus, which was obsessive and interesting, so we came up with the word 'delirium,' and from there, it opened a vision about the concept for the record. And then we went back and we were thinking about when we visited the sanatorium. But that's something that happened way before we started working on the record. It wasn't related in the beginning, because we just went there to visit for our pleasure, for our interest, for curiosity. And so then afterwards, when we found the word 'delirium' and we decided to do this sort of parallel between the bigger problem of mental illness and the craziness of everyday life, then we went back and thought about the experience of being at this sanatorium with all these corridors, where you were walking and seeing all these empty rooms and thinking about all the patients that were there in the past, all the different kind of craziness they were going through. And then we've been also watching some pictures from real sanatoriums in the '60 and '50s, and those [got] our attention because it was nothing like a horror movie — there was no blood, no violence… Just the way their faces were looking, their intense, lost faces, their body positioning… very unnatural, very weird on the bed. It seemed some of them were floating over the bed because their nerves were so tense. So it all together inspired us for the music, for the lyrics, but also for the way that we [took] the pictures, so all the booklet of the record is gonna be pictures and no graphics, no special effects; it's gonna be very realistic, very strong and openly rough, because we wanted to face the concept without taking the piss, without it looking funny, because it's a very serious problem for many people. And although we're not doing a medical report, we're just using the metaphors." He continued: "Some of us have also been going through members of the family with this problem, so we had to visit current sanatoriums. I mean, sanatoriums in their classical shape don't exist anymore in Italy — they're now hospitals with special departments where they treat this kind of [condition]. But still, you can talk with these people and you can see how they're in their own world, and that's scary on one hand and interesting on the other hand, because it's very curious to see why these people… They're completely [unapproachable] when you talk to them and they're completely non-logic, in a way, and that's very interesting. So we thought it was cool to do this parallel between real mental illnesses and the more unstable situation we're living socially, politically and in everyday life as well, and real craziness between the social media, the way people give so much importance to very shallow things and the way we are slaves with the phones always in our hands and the first thing you do in the morning is you check the phone; how crazy normal life is today."